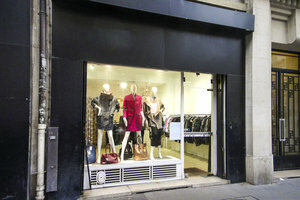 This lovely modern boutique in the bustling area of Beaubourg and close to Le Marais is perfect for Pop-Up Stores, Product Launches and Ready-To-Wear retail. The frontage of this store features a floor to ceiling display window unbroken by framing which creates a seamless modern finish. The interiors are minimal with white walls, spotlights and light carpets. There is a range of product display furniture including garment racks making this space well-equipped for fashion retail. Located close to the retail and fashion hub of Le Marais, this space benefits from high foot traffic and is a great opportunity for brands to gain exposure and connect with customers.